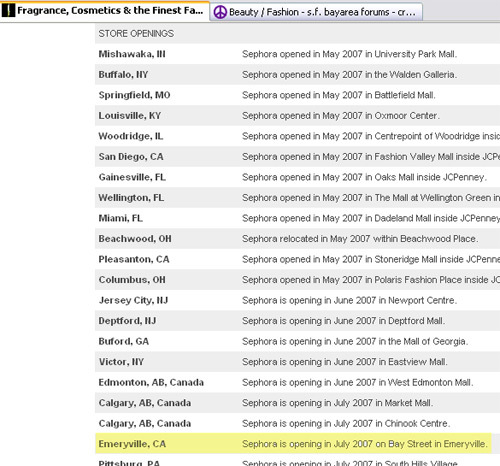 · Dude, we're getting a Sephora! It's already open! It's at the Bay Street mall, near the (also quite new) H & M.
I ducked in there today...it wasn't the first time I'd been to a Sephora, but it was the first time I'd been able to spend an appreciable amount of time in one. First impressions: yup, every brand you ever thought of even thinking of. Vincent Longo, Urban Decay, Nars of course, wall o' perfumes, wall o' skincare, yadda yadda...everything quite neat and inviting. Service: friendly staff, no hard sell. Me: spent most of the time in the Nars section. They don't have everything 100% in stock yet, so they didn't have the Urban Decay "Bourbon" 24/7 eyepencil I was going to check out. They did have UD "Lucky" eyepencil, which was an interesting deep coppery shade, but it wasn't dark enough for what I needed. Nars: they didn't have "Rebecca" duo eyeshadow, or "Habanera." In the Habanera slot, they had what appeared to be half the "Bohemian Gold" duo. First up, an eyeshadow duo. As tempting as the singles looked, the duos are a better deal for me, as long as both shades are useful to me. I don't use tons of eyeshadow at a pop; I've barely dented the three Nars duos I own (Babylon, Ireland and Island Fever), after three years of happy ownership. I almost got the "Stage Beauty" duo...it was in my basket. It's quite pretty: a soft, creamy shade, paired with a deeper, brown-coppery shade tinged with rose. I knew it would flatter my green eyes...green-eyed folks are always drawn toward shades with a form of red in them. But with Nars, I tend to not use them for neutrals. If you're heavily into neutrals, I can see it..."Surabaya," for example, struck me favorably, and of course there is the classical "All About Eve." What to get? Swatched "Blade Runner"...but realistically, as with "Surabaya," two deep shades might not cut it for me. I much prefer the dichotomy of a lid shade and a crease shade (I don't highlight, since I have small lids and too much browbone). And, I don't use eyeshadow as liner; I'm far too lazy. I have a perfectly good eyeliner brush from Ecco Bella, that I haven't used in...years. "Caravaggio" and "Divine" popped out...strong rose, magenta tones...both too young for me (throw "Mediteranee" in there too). Finally..."Jezebel" beckoned to me, more and more. I have no idea yet if this is going to work on me; it all hinges on the soft lavender shade. This is the kind of shade which tends to disappear quickly; I'm hoping the Nars version lasts. Jezebel comes with a deep brown shade, cut with purple, perhaps a more purply version of the deep coppery rose shade in Stage Beauty. Since I couldn't try Urban Decay "Bourbon" eyepencil, and I no longer own a deep brown eyepencil, I swatched some of the Nars pencils. I'd heard the Nars eyepencils tended to be hard in texture. The Urban Decay 24/7 pencils I swatched were silkier, certainly, comparable to my MAC Powerpoints and Eye Kohls. Still, the Nars pencils I swatched weren't what I'd call hard or draggy, just not super soft. I'll report back later on how well they wear, because some eyepencils turn hard after a while. "Kyoto" looked pretty...deep soft olive green, probably better for hazel or brown eyes. "Patmos" was very green. They had only part of the collection out..."Parrot Cay" was an interestingly different, light green. It was "Mambo" I got...deep brown, but tinged with enough red to make it different. I passed on the lipsticks altogether; thinking of trying lipsticks more toward the "health food store" or natural variety. Dude, we're getting a Sephora! There. is. one. near. me. now. too. Seriously,I'm almost hyperventilating over here. I'm either dreaming or I died last night and woke up in either heaven or hell, depending on how on looks at it! LOL!!! I have been to one, the once. It amounted to me jumping off the cable car...oh, for the good old days, when the cable car was included in the Muni Fast Pass. When I lived in the City, if you bought a Fast Pass (universal mass transit pass), you could take the cable car instead of the bus. Didn't cost more (it does now, they want to make money off the cable cars...mumbles...). Anyhow so I jumped off the cable car and ducked into the Sephora. It's not nearly as overwhelming as it sounds. There's tons of stuff, but long time beauty junkies coughs are already familiar with a great deal of it. So you already know what to look at, and pretty much what to buy. I've decided to put off my haul until they open and at least some of the furor has died down. :D Thinking about a Nars lipstick, possibly another Nars e/s duo, and an Urban Decay 24/7 eyepencil or two (I just tossed MAC Permaplum today, it was getting funny).